I read this article and found it very interesting, thought it might be something for you. The article is called The best Mexico all inclusive resorts for every traveler type and is located at https://www.cheaptickets.com/blog/2018/11/the-best-mexican-all-inclusives-for-every-traveler-type/. Like the U.S., Mexico is made up of numerous states, all offering their own beauty, culture, experiences and, of course, culinary feats. From breathtaking—and ahem, exclusive—views in Los Cabos to Cancun’s endless party scene, the right spot for your wanderlust is out there. And, there’s an all-inclusive resort to suit every taste, too, so you don’t have to worry about anything once you touch down. Whether you’re traveling with a gaggle of gals, your partner or kids, there’s an accommodation for every type of traveler. For some, the idea of an all-inclusive screams dodgy buffets and sunburned children, but at Paradisus by Melia Cabos in Los Cabos, the stereotype is upended. Here, an oversized pool gives kiddos plenty of space to splash around, and an on-site kid’s club gives mom and dad a break, too. As a bonus, there’s an entire separate check-in area—complete with a snack bar for children at their height level—that takes some of the chaos out of family arrivals. With healthy options and even a menu crafted by a Michelin-starred chef, have a relaxing vacation… with babes in tow. Whether your best single friend is finally getting married or you’re planning a family reunion with all of your extended cousins, you need a resort that can host your party. Though options are countless in Cancun, The Grand at Moon Palace is the mack daddy of all-inclusives, featuring countless dining areas, nightclubs, wedding venues, pools and of course, entertainment. Spend time hopping from one swim-up bar to another, supercharge your adrenaline on their water slides or sample a bit of everything at their various buffets. Bachelorette parties: Moon Palace also offers makeup, facial and hairstyling classes—complete with a cocktail (or three). If you’ve never heard of the Mayakoba region, you’re in for quite a romantic treat. Sandwiched between Cancun and Playa Del Carmen is this eco-friendly dreamland, filled with birds, monkeys, crocodiles and turtles. It’s home to many luxury properties—from Banyan Tree to Rosewood—but Fairmont Mayakoba is the only one to offer an “all-inclusive 5-star” experience. For an additional nightly fee, newlyweds can enjoy culinary and mixology creations at every on-site restaurant. Couples also benefit from jungle seclusion, as well as private beach access, en suite infinity pools and various tours, including kayaking, windsurfing and more. Though it is definitely on the pricier side, you only get married once. 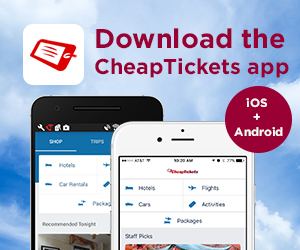 RELATED: Join CheapCash and enjoy a fiesta of savings! If your post-college plans include trekking through Central America and Mexico, you’ll probably need a break from hostels after a few weeks. But since most resorts are beyond a backpacker’s budget, you’ll need to find one that’s at a manageable price point, like Fiesta Americana Puerto Vallarta. Featuring a taco shack, an Italian and Japanese restaurant, as well as a buffet, this inexpensive all-inclusive might not be fancy, but it definitely won’t leave you hungry. It also is only twenty minutes from the Zona Romantica, making for a cheap ride into town to explore PV’s famed art scene and nightlife. Whether you’ve been hitched for a decade or three, making it through the many highs and lows of married life is cause for celebration. Stop searching for the best-of-the-best and allow us to introduce you to the majestic all-inclusive Excellence Playa Mujeres near Cancun. Playa Mujeres is an adults-only property, so you won’t have to worry about children splashing water in your champagne glass. Instead, lounge in your oversized and opulent suite, play a round at their private golf course, and of course, spend at least one afternoon at their high-end spa. Even if you aren’t Insta-famous, you might still enjoy snapping a pic (or 100) to stir envy in your friends back home. Though the crystal-blue waters of the Caribbean don’t require a filter, if you want a background that truly earns those double-taps, consider staying at the all-inclusive Occidental at Xcaret Destination in the Riviera Maya region. You’ll definitely have to set aside time for a photo shoot, since you can pick from an adults-only saltwater pool on the edge of a cliff; crisp, white sands on a private beach within a cove; luxe cabanas overlooking the sea; monkeys dangling in the trees behind you; parrots chirping in the lobby or traipsing across bridges in the jungle. Just make sure to bring an extra battery pack. I read this article and found it very interesting, thought it might be something for you. The article is called Punta Cana’s best budget-friendly, all-inclusive resorts and is located at https://www.cheaptickets.com/blog/2018/09/punta-canas-best-budget-friendly-all-inclusive-resorts/. Punta Cana is one of the Caribbean’s hottest destinations for a reason. Fantastic beaches, over-the-top pools, rainforests, history, culture and of course the Brugal family rum that’s been flowing since 1888. Add wind surfing, ziplining, sailing, kayaking and golf to the mix, and this could be just about anyone’s dream vacation. Fortunately, Punta Cana is also famous for its variety of resorts, so whether you’re looking for a romantic getaway, family trip, guy or gals adventure, or even a solo vacation, you’re likely to find something to fit your budget—even if it’s a modest one. Here’s a look at some of Punta Cana’s best all-inclusive resorts that offer big value at a great price. 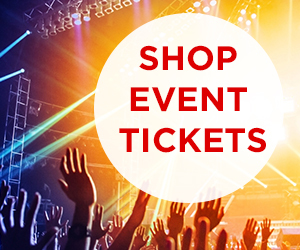 And to get an even better deal, be sure to check out our latest sales and promo code here. 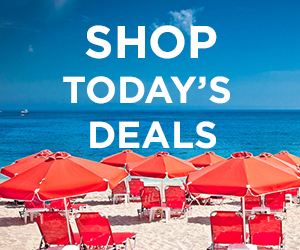 ALSO: Sign up for CheapCash and add even more savings to these stellar resort deals! I read this article and found it very interesting, thought it might be something for you. The article is called Fabulous Fido-friendly hotels in America, equally fun for both you and your dog and is located at https://www.cheaptickets.com/blog/2018/09/fabulous-fido-friendly-hotels-in-america-equally-fun-for-both-you-and-your-dog/. 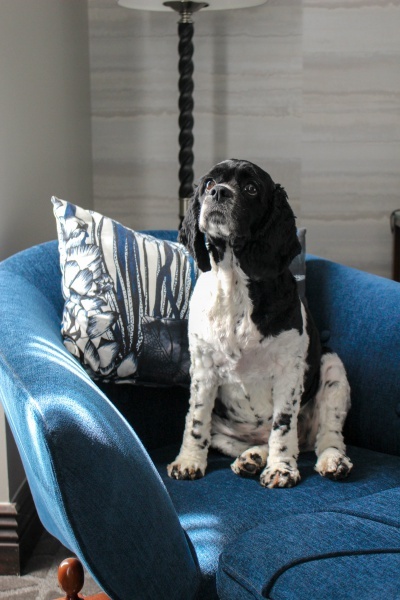 If you’re a dog owner, it’s always nice to find a property that welcomes your favorite four-legged friend in style—after all, the goal is always to find a hotel that is as comfortable for pets as it is for humans. 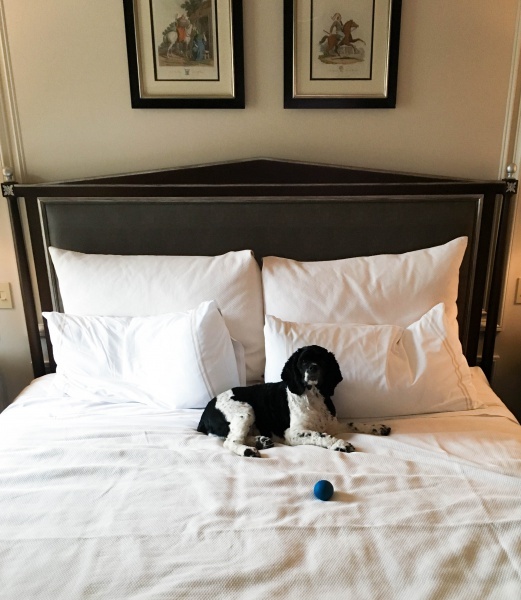 If you’re the type of person who thinks of your dog as your child and can’t bear the thought of leaving Rufus behind, book a room at any of these hotels for your next vacation. Not only do these hotel welcome your pet with open arms, but there’s plenty great things to do in the area, so you dog can join, too. If you’re looking to visit Washington DC, a stay at The Jefferson is certainly in order. Stately guest rooms greet humans and dogs alike. As soon as you walk into your suite, you’ll find a baggie of dog treats sitting there waiting for your tail-wagging companion. Washington DC is such a great city to explore on foot, so leash up your furry friend and head out. Whether it’s a walk past 1600 Pennsylvania Avenue or a trip to the Washington Monument, you’re both sure to get plenty of cardio activity in while refreshing a history lesson or two along the way. A grassy lawn, perfect for waterfront strolls, will greet you at Maryland’s Inn at Perry Cabin. Large guest rooms, complete with a dog bed, ensure a relaxing stay and good nights rest for all after a day spent outside. The luxury inn is set within the town of Saint Michaels, which is about as quaint as they come. The main street is chock full of cute boutiques and candy stores. With your dog in tow, look for the pink facade along this stretch; St. Michaels Pet Supplies is a dreamland of treats and toys for your pup. No matter the time of year, there is plenty to do in Minneapolis and Saint Paul, Minnesota. Leash up your pup and take a walk around the Lakes District or head to Stillwater for a stroll along one of America’s most charming Main Street. Hotel Ivy is a perfect home base for your time in the Twin Cities. A delicious restaurant and subterranean speakeasy give you little reason to leave. If your dog loves treats, he’ll agree. Along with a doggie bed in the room, he’ll receive cute biscuits with icing on top, too! 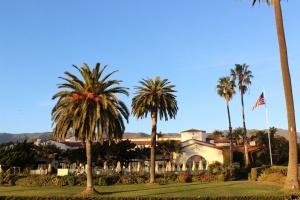 Nestled in the hills of Montecito, California, the Four Seasons Resort The Biltmore Santa Barbara is an idyllic retreat. Luxe accommodations tempt you to stay in your room all day, but don’t! The property has a beautiful garden, croquet lawn and pool to enjoy. Butterfly Beach is a stunning place to catch the sunrise or sunset and during the day. With huge beachfront, there are plenty of other dog-and-human pairs playing fetch and games along the iconic stretch of sand. ALSO: Earn CheapCash towards your next getaway with Fido—it’s free to sign up! Host to the Winter Olympics of 1932 and 1980, Lake Placid, New York is riddled with cool Olympic game relics. Visit the Olympic ski jump or the skating oval and imagine the rush the athletes must have felt. Venture over the Mirror Lake and give your pup a lesson in dog-sledding; during the winter months, mushers and their dogs can be found gliding across the frozen lake. 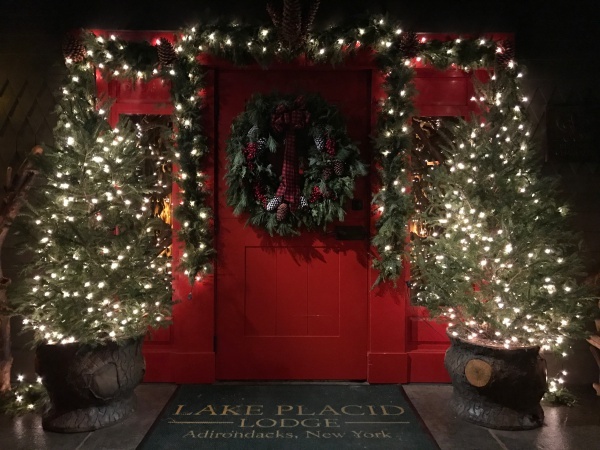 Head back to Lake Placid Lodge and check into one of the dog-friendly waterfront cabins. The cozy cabin feel will relax you immediately and s’mores by the fireplace (no chocolate for the dog!) are the perfect treat to end the day. 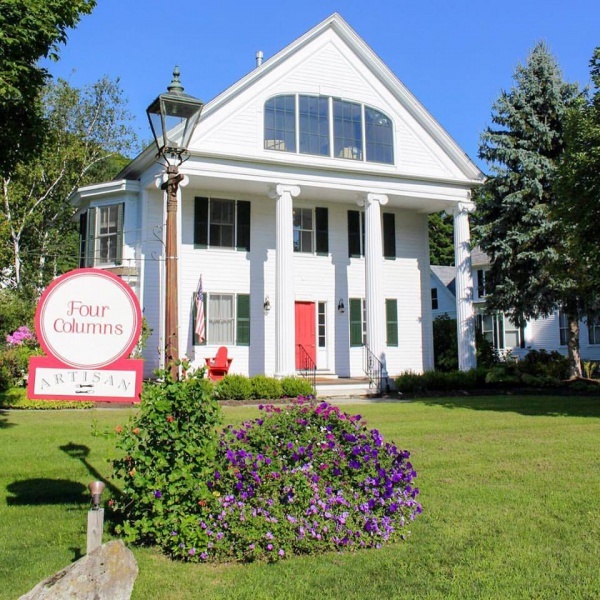 The Four Columns is a beautiful, quaint boutique hotel in Newfane, Vermont that welcomes both you and your dog. There’s lots of outdoor activities in the area, but area that stands out lies just 20 minutes away, called Jamaica State Park. With a myriad of trails, you could spend hours exploring nature with your four-legged friend. Steep inclines are sure to raise your heart rate and the waterfall at the end is the perfect place for a picnic. After a day of hikes, head back at the Four Columns, where your dog will relax and the hotel will bring a pup-bowl right to the room. 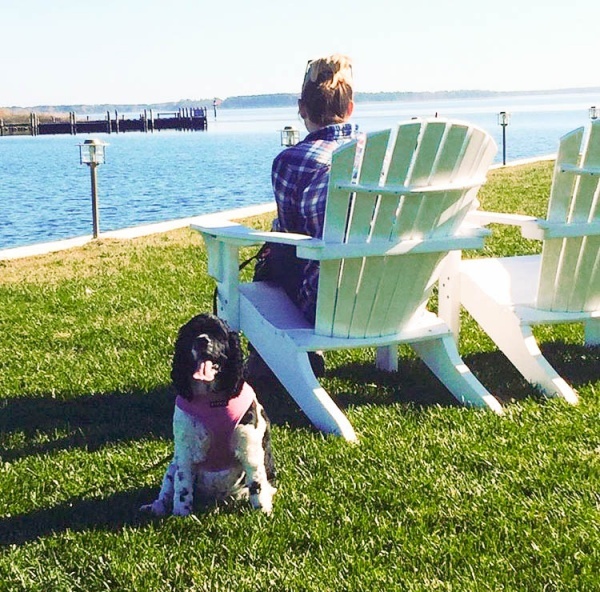 Perfectly situated across from the beach in Edgartown, Martha’s Vineyard, Harbor View Hotel is an ideal spot to vacation with your canine. The Captain James Huxford Cottage provides you with a home away from home with a cozy living room, fireplace and kitchenette, as well as a spacious bedroom. Take your dog on a walk along the beaches, set out to explore any of the several lighthouses on the island, and stroll along the quaint streets admiring some of the incredible Vineyard estates. Since the island’s not the big, you can also put your pup in the car and head to the western shore of Aquinnah to walk the beautiful cliffs of Gay Head. …and let Hotel Saint George be your home base. The newly renovated hotel is hot on the travel scene right now and, luckily for you, it’s also dog friendly! Like all good Texans, they’re laid-back folks at this hotel and are more than welcoming of four-legged friends. Their guest rooms have plenty of space for your dog, and outdoor sidewalk seating provides a great spot for you to grab a cocktail with your dog along, too. During the day, bring your pup along to explore the bustling art scene in the area. From Prada Marfa to the Chinati Foundation, modern and eclectic art abounds in the remote Texas town, and roadside art installations make it easy to pull off for a picture or stretch the legs. About 30 minutes east, the town of Alpine has an adorable main drag to wander down any time of day. I read this article and found it very interesting, thought it might be something for you. The article is called 11 hotels that will blow up your Instagram feed and is located at https://www.cheaptickets.com/blog/2018/06/11-hotels-that-will-blow-up-your-instagram-feed/. Looking for more Insta likes? These hotels have just the right aesthetic backdrops, creative focal points and playful props to make your followers go nuts. You’il not only be left with some amazing pics—but also unforgettable memories. The Parker is an Instagrammer’s playground. 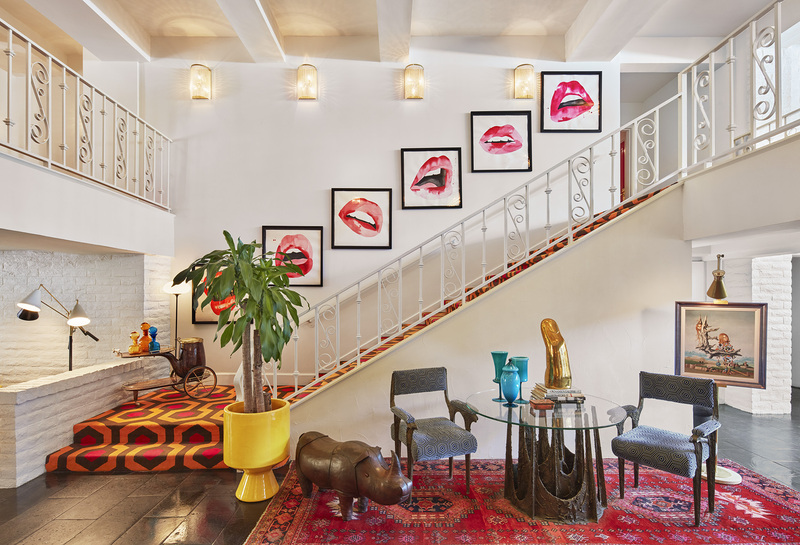 With touches such as bohemian-inspired swinging chairs in the lobby, macramé artwork, a carpeted stairway straight out of The Shining, a wall lined with lip paintings and bold bursts of color everywhere, there is no shortage of Insta-worthy focal points at this hip desert hotel. Pose in a stylish high-back rattan chair or by the fire pit on the rooftop lounge overlooking the Gaslamp Quarter at the Hotel Republic. Want a more active shot? How about morning yoga on the outdoor terrace or zipping around town on one of the hotel’s electric scooters or beach cruiser bikes? Wander to nearby Little Italy for a double scoop of gelato—food is always an Instagram hit. Photo in a Woodie? Check. Photo spinning vinyl? Check. Photo at an antique typewriter, an Airstream and a neon “Let’s Get Physical” sign? Check, check and check. The Goodland, technically located in nearby Goleta, actually has a map of hot spots on the property for taking Instagram photos. Post your pics with the hotel tag at all spots and receive a $10 dinner voucher. But don’t spend all your hours obsessed with your Instagram feed: Leave time for yoga, game night, s’mores and dancing to DJ’ed music. 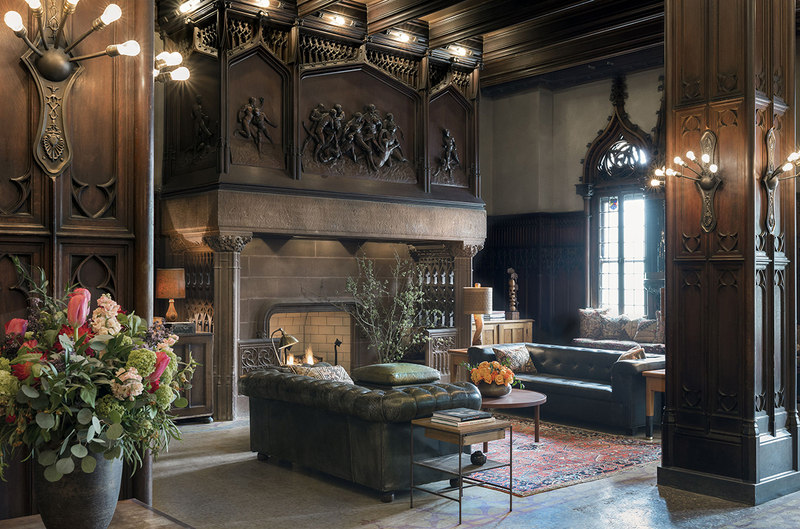 The 1893 architecture of the Chicago Athletic Association Hotel alone lends itself to storytelling, plus there are plenty of creative spaces with interesting features. The interior oozes turn-of-the-century charm with a lobby featuring ornate dark wood pillars and ceilings, oversized brown leather chairs, and subdued lighting. 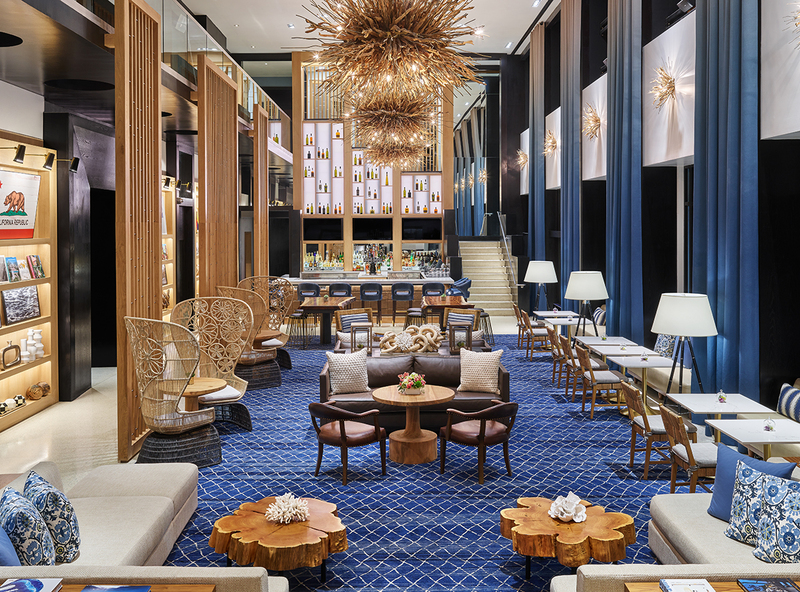 In juxtaposition to the lobby’s library vibe is the open and airy rooftop restaurant, Cindy’s, boasting views of Millennium Park and the Lake. Don’t miss the opportunity to enjoy the photogenic Game Room, featuring bocce, billiards, shuffleboard and more. Las Vegas is the land of elaborate selfies. 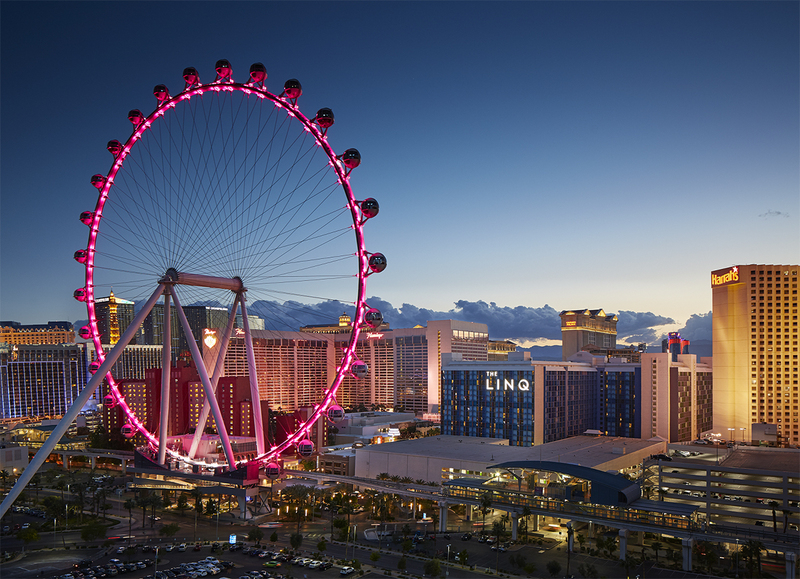 One of the most popular attractions for photos from below and above is the High Roller observation wheel at The LINQ Hotel & Casino. Step into a spherical “cabin” to enjoy a 30-minute loop. At the top of the wheel, take photos of the sweeping views of the Las Vegas Strip while pounding shots with friends, doing morning yoga, or enjoying champagne and chocolate. Afterwards, retreat to Influence, the adults-only pool area featuring an above-ground pool with peek-a-book windows. ALSO: Picture yourself in paradise! It’s easier than you think when you join CheapCash! 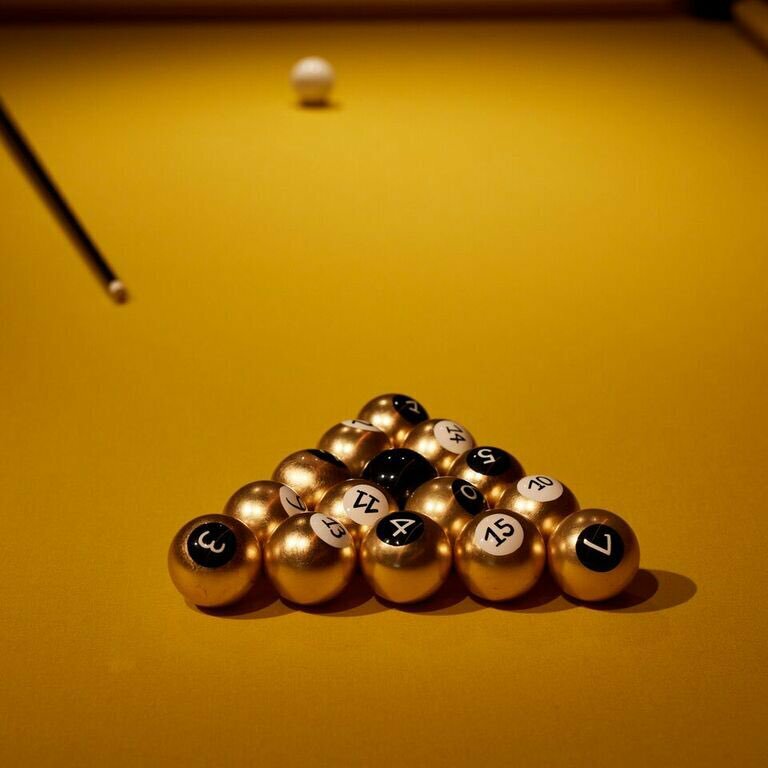 PUBLIC Hotel provides creative composition opportunities in its unique garden setting, skyline views from its rooftop, posing in front of the electrically-lit escalator or while playing pool with gold-colored balls in the swanky lobby. There are plenty of spaces and places to work, play, party or unwind in this fashionable Lower East Side gem from hotel superstar Ian Schrager. Stepping in to the lobby Trumbull & Porter, guests will encounter a modern industrial atmosphere reflective of Detroit culture featuring photogenic custom-woven artisan furniture, hip exposed concrete and electrical pipes, white-washed brick and casual seating. The hotel offers city views, spacious settings for socializing, and bikes for exploring historic and Instagram-worthy Corktown. Check out the Insta-worth mural above the hotel’s front sign! 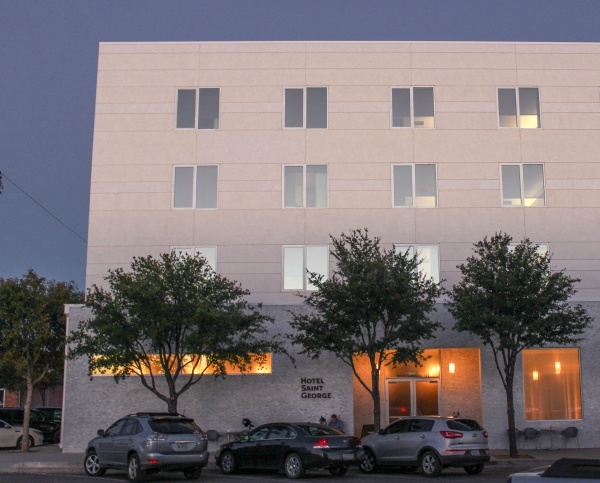 Instagrammers will love this art-inspired hotel in Dallas. 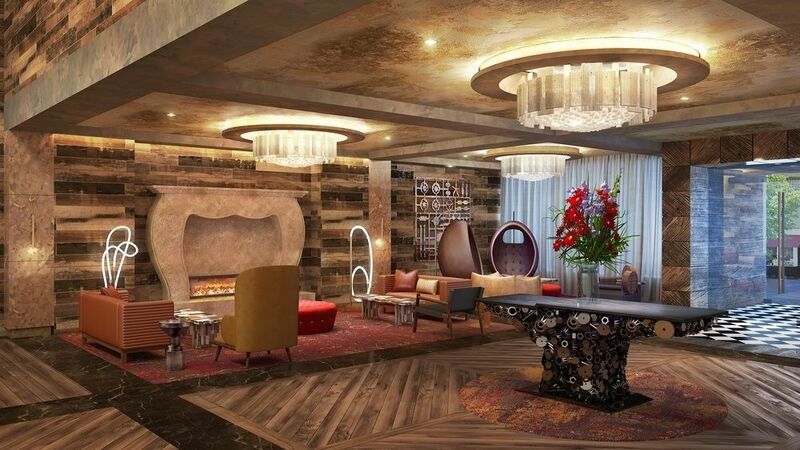 The Lorenzo Hotel’s art collection alone is sure to get your creative juices flowing. With pops of color, interesting wall murals and colorful exterior, you’re sure to find more than one place to stage the perfect shot. Don’t miss Einstein mural and figurines surrounding the happening pool! Be ready to photograph and listen to amazing bands (it is Nashville, after all) at Bobby Hotel. For optimal shots, take advantage of the effective mood lighting, off-the-hook artistic industrial design and classic Scenicruiser bus-turned rooftop lounge. 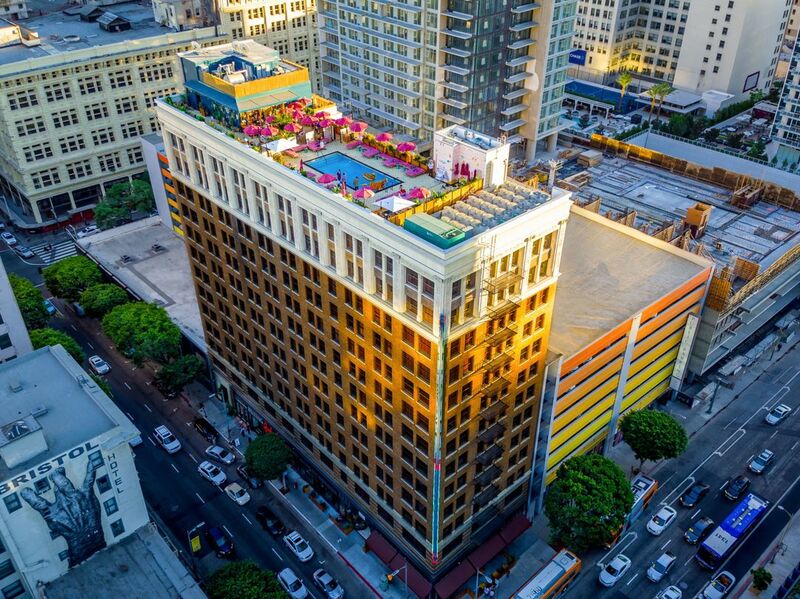 Scenic city views, eclectic cuisine, historic architecture and rooftop pool parties make The Freehand in Downtown Los Angeles an Instagrammer’s paradise. Bunk with friends in a shared room, try a tea-infused cocktail (every Instragram account needs a pretty libation) and shop for fresh flowers at the adjacent gift shop. I read this article and found it very interesting, thought it might be something for you. The article is called These are the 9 coolest motels in America and is located at https://www.cheaptickets.com/blog/2018/02/9-coolest-motels-america/. The word motel, which derives from morphing the words motor and hotel, probably conjures a cheap, roadside stopover these days. But in the 1950s and 1960s, thousands of charming mom and pop motels sprouted up around the country, coinciding with the development of the interstate highway system. As the decades passed, though, many of these properties went belly up or fell into disrepair. 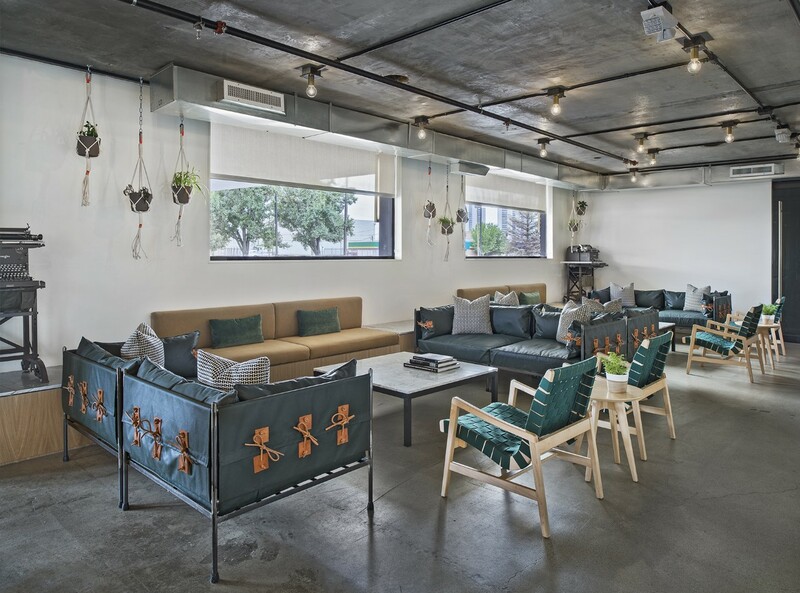 Now, hoteliers are seeing the potential in reviving some of the down-but-not-out properties for a retro-obsessed hipster crowd, thereby bringing boutique chic to the motel landscape. Here’s a look at some of the coolest of the bunch. 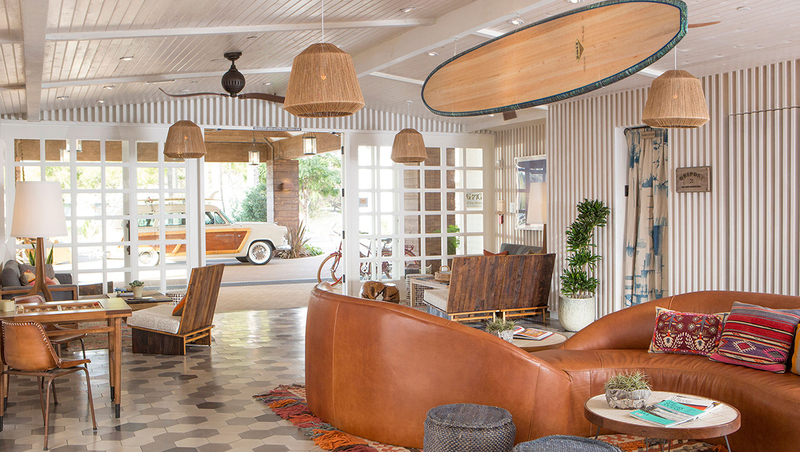 Palm Springs is all about retro chic, so it’s no surprise that the folks at Ace Hotel decided to dust off a neglected Westward Ho (complete with a Denny’s), give it some love and open afresh. The rooms at Ace Hotel & Swim Club sport a desert decor, with bedspreads made from tent canvas and bathrobes that any Bedouin would be proud to don. Oh, and that Denny’s? It’s now King’s Highway, serving Middle Eastern cuisine with a California twist. Austin Motel: Austin, TX The Austin Motel has been operating since 1938, but its current design, by legendary Austin hotelier Liz Lambert, reads mid-century groovy. Check out those orange vinyl tufted beds. In the Pool Suites, dig the coin-operated Magic Fingers vibrating bed. More titillating enjoyment is on hand at the ’50s-style outdoor pool, which hosts “Richard Simmons-style” water aerobics classes and synchronized swimming shows. A lot of motels sit roadside, but others reside beachfront. Sound View, on the North Fork of Long Island, hearkens back to the golden era of beachside motels. 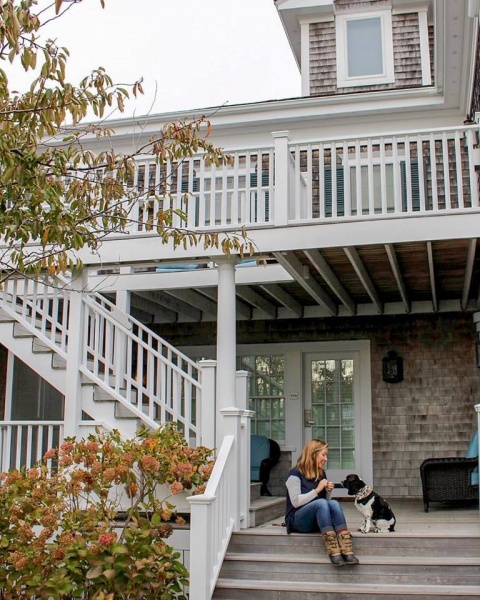 Sit on your private balcony and gaze out over Greenport’s private beach, or enjoy a room filled with nautical undertones that nod to the town’s fishing and boating history. The nostalgia of a classic motel hasn’t faded: Kitchenettes and tiled bathrooms flash back to the past. 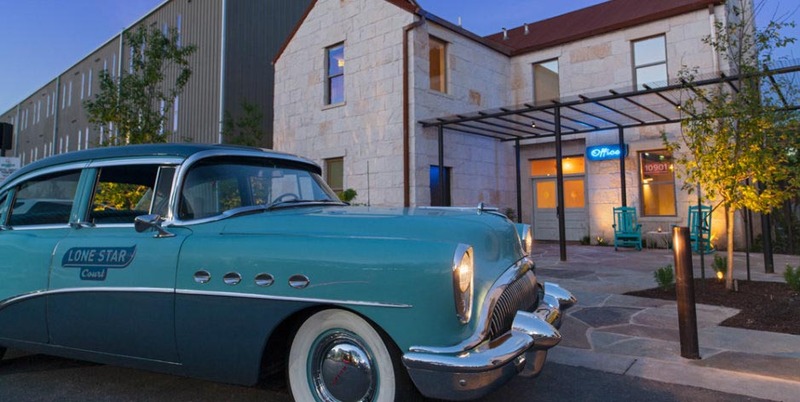 More American retro is available at The Halyard, the on-site restaurant run by a James Beard Award-winning chef. The Pioneertown Motel sits on the western outskirts of Joshua Tree National Park. It was originally built in 1946 by one Roy Rogers (Hi, Ho, Silver!) in order to house movie stars who were desert bound to shoot Westerns. More than 70 years later, it still feels like you should be wearing chaps and cowboy boots as you walk onto what looks like the set of an old Hollywood oater. Still, the motel’s 19 rooms are designed with an updated, albeit simple modernity to appeal to modern cowboys and cowgirls. Unscripted Hotel: Durham, NC Unscripted Hotel in North Carolina’s Research Triangle adds a new chapter to what was once the Jack Tar Motor Lodge. 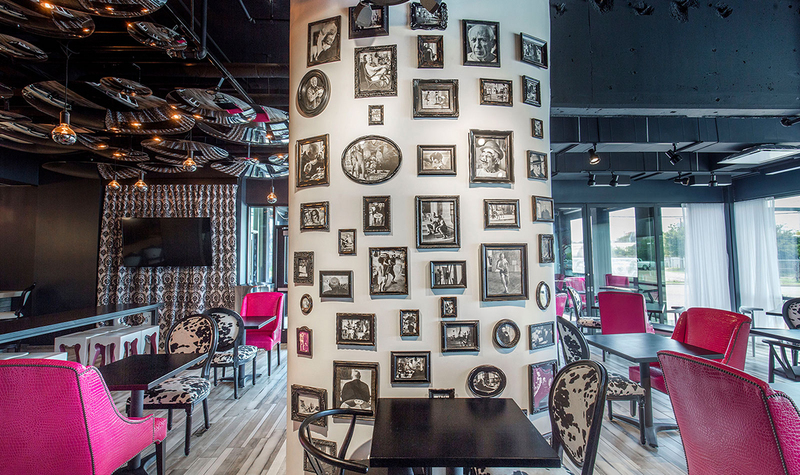 The rooms recall that motel’s 1960s heyday, blending the decade’s pop design with modern functionality and unexpected details, like custom murals with psychedelic patterns. Socialize at the rooftop pool bar, or wander down to The Studio, a playful take on the classic mid-century rec room. There’s more on tap at Pour Taproom, a pay-by-the-ounce craft beer and wine bar, and at allday, which is part coffee bar, part meet-up spot. When The Farmer’s Daughter opened near the Original Farmers Market during the 1960s, it was a popular lodging spot for starry-eyed ingenues coming to town seeking fame and fortune. However, by the 1980s, it had become somewhat of a no-tell motel. As the neighborhood’s fortunes turned in the 1990s, so did those of The Farmer’s Daughter. The aging ingenue underwent her most recent facelift in 2016. Rooms feature one-of-a-kind installation boxes showing various interpretations of the “farmer’s daughter” lifestyle. Other handmade artwork pops up throughout the hotel and the boutique features a variety of curated clothing and accessories made by local designers. Calistoga is known for its mineral-filled mud and springs. Why not take a bath in it at the Calistoga Motor Lodge and Spa? Enveloped by the Mayacamas Mountains, this vibrant, yet laid-back property is a classic 1940s roadside motel reimagined with a road-tripping theme. Each room is outfitted with a camper banquette and splashes from a mid-century color palette. Explore the secluded, whimsical spa, modeled after a classic bathhouse. Anchored by geothermal mineral water-fed pools, the spa puts a quirky spin on mineral baths and therapies from around the world. A neon road sign welcomes all callers to The Jupiter in Portland’s Burnside neighborhood. The 1960s motor lodge maintains its original exterior, but a recent update has brought a bit of Portlandia inside. As you enter your room, a personalized message appears on the chalkboard door. Rooms are simple….and those earplugs by the bed are there for a reason. Still, for those who like to be in the center of the action, the neighborhood is filled with hipster hangouts, and trendy live music joint Doug Fir is motel-adjacent. A funky blend of Mexican, Native American and Northern European influences, Tucson deserves a hotel worthy of its arty and eclectic vibe. Enter the Downtown Clifton Hotel, a true mid-century gem featuring guestrooms outfitted with vintage furniture. This seductive and budget-friendly charmer sits a short walk from the city’s vibrant and compact downtown and boasts Instagrammable murals, a low-key hangout area and discounts to the coolest bars and eateries around town.